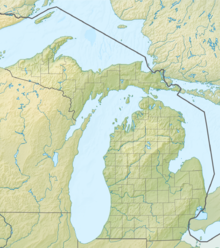 Ionia County Airport (FAA LID: Y70) is a public airport located 3 mi (5 km) south of Ionia, Michigan. Opened in 1937, the airport is currently owned by Ionia County. It is included in the Federal Aviation Administration (FAA) National Plan of Integrated Airport Systems for 2017–2021, in which it is categorized as a local general aviation facility. The airport has a 4,300 x 75 ft. E-W primary paved runway and a 4,290 x 340 ft. N-S secondary grass runway. Glider activity abounds, with glider instruction available on the field. Benz Aviation operates on the field, offering flight instruction, aircraft maintenance, and aerial advertising. Flight instruction consists of a Part 141 flight school as well as glider training. The School of Missionary Aviation Technology (SMAT) also operates on the field, providing maintenance and flight instruction for aspiring missionary pilot-mechanics. ^ "List of NPIAS Airports" (PDF). FAA.gov. Federal Aviation Administration. 21 October 2016. Retrieved 25 November 2016. This article about a Michigan airport is a stub. You can help Wikipedia by expanding it. This page was last edited on 24 March 2018, at 02:07 (UTC).